When I wrote my previous rebuild update in December, I thought I wouldn’t write about this motorcycle again until after it was reassembled, running and ready to show off. But then, my XL250 project was accepted to the One Moto Show. And that changed everything. Getting the official invitation was beyond exciting — it was the “LAST 1,” printed in white marker on the leather invite. For a first time builder, it’s a dream come true. But knowing this bike will be in a show has added a new layer of anxiety and intensity to this project. Before, I was gunning to have it done by the show to meet a personal milestone, so that the bike would be done by the two-year anniversary of the day I brought it home. Now there’s a concrete deadline, and the certainty that this build will be looked at, perhaps even scrutinized, in the company of more than a hundred other gorgeous bikes. Can anyone say “impostor syndrome”? For the past three weeks, I’ve done little else but work on this motorcycle. Every second of down time, I’m out in the garage. And honestly, I’m quite pleased with the way the bike is coming together overall. It was a good looking bike before I stripped it down, and now that it’s cleaned up, painted and less obscured by plastic it looks even better. But, as you would expect, there have been speed bumps — different kinds of speed bumps than the ones I’ve faced in the past. In the past month or so, the obstacles I’ve faced have been of my own making, which is a new and frustrating challenge. How fast can you paint a carburetor? It all started in early January, when I put the carburetor back on the bike for the first time since the engine was painted. I hadn’t thought the carburetor would need any attention. Inside it was almost spotless, and the bare metal finish was in good condition, so I decided to leave it alone. But when I put the carburetor on the bike that day, I knew I had to paint it. And I had to paint it right now because the weather was just right, and I couldn’t count on it being that way for long. In the span of one day, I dismantled the carburetor, gave it a thorough cleaning, masked it off, hung up my paint booth and gave the carburetor a fresh coat of paint. By the time I got it all done, I was feeling pretty good about myself. But when I pulled down the pieces the next day I discovered that I hadn’t done as good a job as I thought getting all the tiny nooks and crevices covered. So, a week later, I strung up the paint booth again and fixed my mistakes. I used a flashlight to make sure everything was covered, and this time the paint came out well — not perfect, but it would work. The next day, I reassembled the carburetor, thankfully not scratching it too much, and installed it on the bike. It looked gorgeous, a perfect tie-in with the engine and the copper. It might have taken me a while, but it was worth the wait. Obstacle cleared. For the next few days everything went relatively smoothly. I blew a couple fuses but got my turn signals and brake light working. I cut down my speedometer bracket to get a better fit. I wrapped the wiring harness and sealed up the side covers. As I set up the brakes and cables, though, I discovered my next obstacle. Apparently, when I de-tabbed the frame nearly two years ago, I got a little overzealous with the angle grinder and razed off the rear brake return spring mount, the rear brake light switch holder, and the clutch cable holder. At first, I didn’t know what to do. I thought I would have to beg someone I knew with a welder to add some mounts back for me, and hopefully do it in a way that didn’t completely wreck the powdercoat before the show. Or, perhaps worse, I’d have to go to the show without cables — which would be a sure signal that my XL doesn’t run. I spent some time with the problem, though, and slowly I started to find solutions. The old passenger peg mount was placed close enough that, if I slid a bolt or pin in there, I could hook a spring to it for the brake. For the clutch cable, I cut a holder from some sheet metal and mounted it to one of the frame bolts. Another sheet-metal holder now supports the brake light switch. I’m not terribly proud of these fixes — they don’t feel very professional, and they’re borderline safety-wise. But they did make me feel, just a little, like a builder. Of course, a smart motorcycle builder would have had the foresight to check these important mounting points before powdercoating the frame, but… solving problems, using the materials at hand… that’s the spirit of building a custom motorcycle, right? Originally, I planned to keep the stock exhaust. It was a bit chunky, but mine was in good shape, and it looked fine with a rear fender to balance it out. So I had it ceramic coated when I sent the frame out to powder coat. But I didn’t end up making a fender. I made a tail light bracket instead, and told myself the exhaust would look better once I got a seat on it. After I got my seat back from Range Needlework (who did a fabulous job, thanks Roxan! ), I put the exhaust back on and, well… it didn’t help. It doesn’t look terrible, but for the first time in this project I had a strikingly clear intuition about what this motorcycle should look like… and this wasn’t it. The stock exhaust hangs low and heavy off the tail section, jutting out almost six inches past the tail light. It might look better once the tank and side cover are there to balance it out, to distract attention from it, but… I couldn’t help myself, I started looking for a different solution. Less than two weeks before a show. I have a couple ideas, but it’s very unclear whether either will pan out. Eventually, something’s going to change with that exhaust. But before the One Show? In truth, however, these past few weeks have been hard. I’m beyond honored to be invited to the show, but it’s triggered my impostor syndrome, and some difficult anxieties. Now, nearing the end of this project, I can’t help but wonder if I have found what I was looking for. It’s a difficult question to ask while mired in the chaos of reassembling a motorcycle that’s been strewn across your garage for the past two years. Not to mention the anxiety of being on a deadline, and the deep-seated fear of being “found out” as someone who doesn’t really know what they’re doing. In the past few days it’s become obvious that this motorcycle project has come to represent my internal turmoil, and I need to get this build done so I can show myself that chaos and confusion is temporary. That there will be a resolution, as long as you keep going. Despite the fact that it’s a cliché and not true, the phrase “it’s always darkest before the dawn,” comes to mind. I have one full weekend left before the show. The tank and side cover will arrive tomorrow, and that will kick off a weekend of mad-dash wrenching like I have never had before. At that point, I’ll have everything I need to finish the bike. Everything I need to get it, at least, presentable. To wrangle the last of the wiring, to figure out what I’m going to do with the exhaust. If you’re in the Portland area, I hope you’ll make it out to the show. I’ll be there all weekend and at the races on Saturday night, armed with smiles and free stickers. Thank you, as always, for following along on this project. Wish me luck, and I hope to see you at the show! Thinking about starting your own motorcycle project? In these last few weeks, being part of the Krank Engineering community has been indispensable. Matt and Jordan have been there with last minute ideas, answers to questions I couldn’t find on Google, and endless support. I can wholeheartedly say that I wouldn’t have made it this far without them. 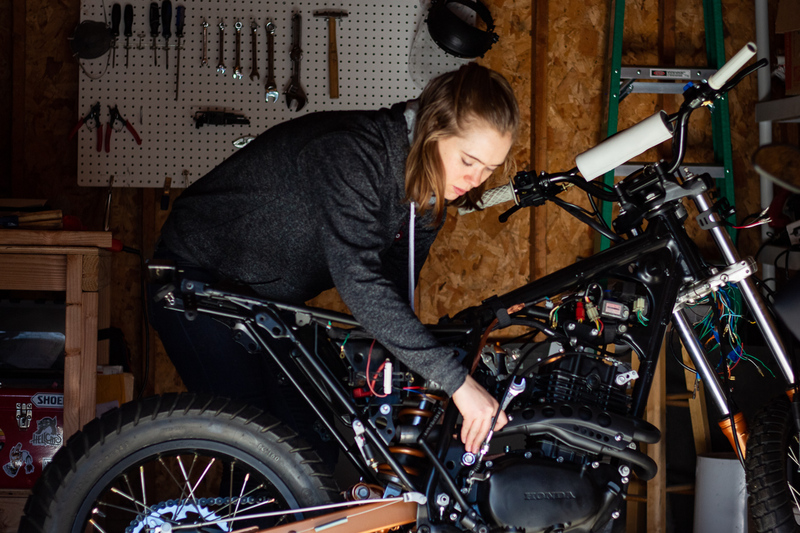 If you’re interested in building your own custom motorcycle, and you don’t know anyone with motorcycle build experience — or you don’t want to irritate the ones you do know 😉 — Matt’s community is an excellent resource. In addition to giving advice over his forums, Matt provides beginner-level courses to help newbie builders learn the skills they need to build their first custom motorcycle. Being an affiliate for Matt’s community helps me continue to create quality content for readers like you. Read more about my affiliate policies here. Good luck at the show! Your build has been great fun to follow, I can’t wait to see pictures of your XL when it’s done!